Open every day from 10am to 5pm. Wheelchair access. Official opening of the OHPS exhibition ‘Broderick and Blomfield. Hastings Photographers’ by the Mayor of Hastings, Cllr Kim Forward. Family History Day at the History House. Come along with your genealogical enquiries. Walk starting at the History House ‘A Regency Walk’ including a chance to visit a flat in Pelham Crescent. Refreshments will be available. Tickets £3. Fundraising raffle tickets are on sale at the History House to raise money towards the installation of a lift. Tickets £1 each, with a cash prize of £50. Tickets where indicated can be booked in advance by phoning the History House on 01424 424744. Meet at top station of West Hill Lift (at west end of George Street - Take a trip up in the lift or walk up via Cobourg Place and over the west hill). The official Old Hastings Preservation Society walk, with experienced guides, proceeds gently downhill into Hastings’ historic Old Town, with its wealth of historic and picturesque buildings, hidden byways and literary associations and takes approx 90 minutes. There is no charge but donations to the Old Hastings Preservation Society are welcome. Old Town Walks were started many years ago by founding members of OHPS who wished to share the atmosphere and history of the unique Old Town with visitors and residents alike. Over the years, research has uncovered more fascinating facts and our guides are well versed in the history of the area, having personal interests in the subject and most of them living in the Old Town. Our guides are happy to arrange walks at any other time of the year. Please phone 01424 420555 for more information. Groups of 10 or more - please book in advance. Student groups welcome but must be booked in advance. The Old Town Walk booklet, price £2, is available from the History House, 21 Courthouse Street, and the Fishermens Museum, Rock a Nore. An interesting and unusual guided walking tour of hidden narrow footpaths, flights of steps and nooks & crannies, many with a tale to tell. The tour, lasting approx 1hr 20mins, involves some steps and steep inclines and will include amusing factual and historical anecdotes. Conducted by Clive Richardson, British Tourist Authority Blue Badge Guide. Tickets in advance £4 adults, children £3 under 14, from Shipwreck Museum, Rock a Nore or from guide on the walk at £4.50 adults, £3.50 children under 14. Donation to Shipwreck Museum and OHPS. An opportunity to learn about the Hastings fishing fleet and to enjoy finding out about the cultural and environmental heritage of the Stade. Walks last approx one and a half hours and are led by Stade Education Project Volunteers. Walks are free but donations are appreciated and are given to the Fishermens Museum, Shipwreck Museum, Fishermens Protection Society and the Stade Lifeboat Station. The ground can be uneven so the walks are not suitable for people with mobility difficulties. See www.hastings.gov.uk/stade_education for more details or phone the Stade Education Officer on 01424 451167. Macabre meander visiting sites associated with grim and gruesome aspects of Old Hastings less illustrious past. Definitely not for the squeamish! May not be suitable for some children. Walk lasts approx 1hr 20mins. Tickets £6 adults, £4 accompanied young person under 16. Dogs on short leads permitted. Suitable for wheelchair users. Donation to OHPS. Exploring atmospheric local burial grounds with evidence of three centuries of funerary art and vivid descriptions of bygone, sometimes bizarre and gruesome, burial customs and practices. Walk lasts approx 1hr 30mins. Uneven surfaces, suitable footwear recommended. Tickets £6 adults, £4 accompanied young person under 16. No dogs please. Not suitable for wheelchairs. Donation to OHPS. Dare you join us to learn of strange local close encounters of the supernatural kind with thought—provoking insights of the elusive spirit world? Walk lasts approx 1hr 30mins. Tickets £6 adult, £4 accompanied young person under 16. Dogs on short leads permitted. Suitable for wheelchairs. Donation to OHPS. Join local author and tour guide, Tina Brown, to celebrate 18 years of the Original Hastings Old Town Ghost Walk. Step back in time and see history brought to life with Tina’s unique and fascinating research. Bring a pen along as there is a quiz to take part in to win one of Tina’s books (a signed copy). Tour last 75 mins and is suitable for all ages. 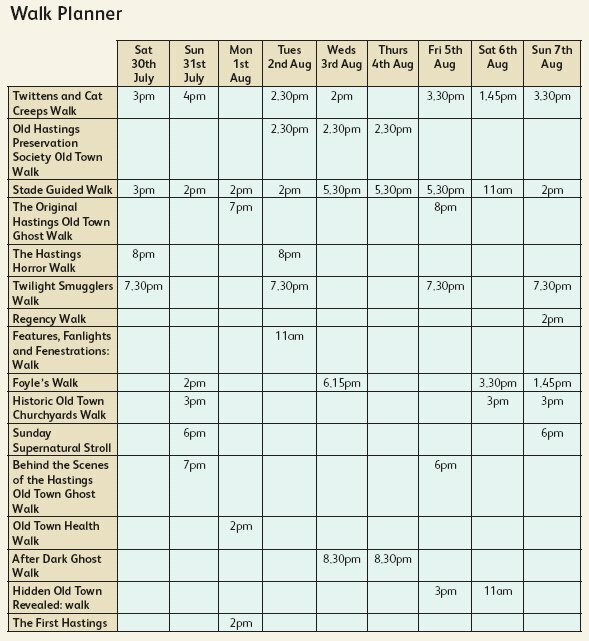 Tickets £5 or buy a joint ticket for the BEHIND THE SCENES OF THE HASTINGS OLD TOWN GHOST WALK for £10. Limited numbers so book early. Any enquiries please call Tina on 07817 686781 or see www.hauntedexperiences.eu for further information. Before William the Conqueror arrived, the port of Hastings was not located in the Old Town valley, but…..where? Find out about the early history of Hastings (and St Leonards), at a guided walk by local historian, Steve Peak. Donations to OHPS. ‘A Regency Walk’ including a chance to visit a flat in Pelham Crescent. Refreshments will be available. Tickets £3. Every day from 10am to 5pm. Lots of information and books at the History House. ‘Roman Excavation 2011’ - new display by Hastings Area Archaeological Group. Wheelchair access. Words and pictures recalling Hastings fishing and the Stade from 1914 to 1945 and the restoring of RX90, The Valiant, at present a project being carried out at the Fishermens Museum by Steve Barrow, boat builder, and students from Sussex Coast College, Hastings. Every day an object from the museum will be chosen by the speaker of the day (see below), who will explain what the object means to them, and to the history of Hastings and St Leonards. All washed up is an exhibition of new work by Michael Dutton created using driftwood and rubbish found on local beaches. It’s amazing how much rubbish we throw into our seas, which eventually gets washed up on the beach. Although it’s sad to see so much junk getting washed up, it also provides the materials needed for these pieces. You can meet the artist on Wednesday 3rd August between 4pm and 6pm. Entrance £1 includes glass of wine, fruit juice or coffee. Refreshments on behalf of OHPS. Portraits take only 10-15 minutes. 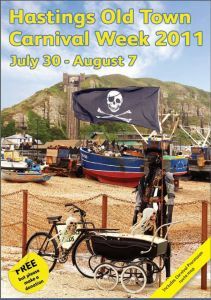 Celebrating Hastings Old Town Week through Film! From Glenn Veness’s exciting and moving local archive films to a Day in a Life, capturing British life in the fifties and sixties. Ahoy there me hearties - we are celebrating Hastings Pirates Day so come in costume to see the classic feature – ‘The Black Pirate’ featuring a swashbuckling Douglas Fairbanks. And for all the beautiful BURLESQUE LOVERS come and watch ‘On Tour’ the comical and moving journey to Paris of a newly formed troupe of burlesque performers. Enquiries: 01424 720393 info@electricpalacecinema.com. Celebrating 18 years of the Hastings Old Town Ghost Walk, this mini museum highlights some of the most haunted places to which Tina Brown, Author and Tour Director and her partner, Jason Neale, photographer, have travelled in search of things which go bump in the night! Ghosts are not just for Halloween!! You will find this display in a dark and creepy corner in Ye Olde Pump House, George Street, Hastings Old Town. Share your spooky thoughts and experiences in the visitors book. Whilst at Ye Olde Pump House why not enjoy one of the specially designed creepy cocktails, from £2.95, to celebrate the ghost walks birthday or stay and enjoy a meal with good food at great prices. A booklet will be for sale at Ye Olde Pump House for the price of £1. Donation from booklet sales to OHPS.